As many of you know, I am currently working on a vegetarian cookbook. My angle is to take traditional recipes and turn them into more healthful vegetarian versions. This is easier said than done. Back when I ate meat, there is no denying that I was an excellent cook. I knew all of the traditional Italian, French and even Chinese dishes and could knock your socks off with some dynamic and dramatically delicious meals. Today? It is not a given that whatever I cook will turn out well. I have drastically reduced the amount of fat, salt and sugar that I cook with. I seldom use dairy. I never use meat or meat by-products such as chicken broth or beef broth, so I have had to find ways to compensate for this. Sometimes they work. At other times, they do not. This isn’t a great photo, but it is shiitake mushrooms, organic baby greens (kale, chard, spinach), garlic and chèvre on a light, herbed crust with pesto. This was a delicious pizza. When I was cooking it, I had the windows open to air out the house, when I heard a knock on the door. It was my friend, Dave, homemade root beer in hand. “I couldn’t help but notice that delicious aroma coming from your house when I walked by, so I thought I’d bring you some of my homemade root beer. Whatever you are cooking will probably taste pretty good with this!” and he was right. This root beer was spectacular, and the perfect compliment for my pizza. He joined me for pizza and root beer and we had a lovely evening watching, “The Last Waltz” together. Sassafras, sarsaparilla and wintergreen, the herbs use to make root beer, are surrounded by a bit of controversy. All of them contain safrole, which was once thought to be a carcinogen. Then again, this article from Nourished Kitchen explains why there is nothing to fear. “Wintergreen leaf, though almost always an ingredient in most traditional root beer recipes, replaced sassafras as the prominent flavor in root beer during the 1960s when a study conducted on lab animals implicated safrole, a naturally occurring polyphenol, in liver cancer. Of course, the lab rats were fed massive quantities of safrole – the human equivalent of consuming about 32 twelve-ounce bottles of root beer a day. After the study was released, the FDA required commercial soft drink makers to remove sassafras from their brews. Of course, cinnamon, nutmeg and basil also contain safrole but this seemed to escape the attention of the FDA. Interestingly, while massive quantities of safrole caused liver cancer in lab animals, it seems that small doses may actually play a protective role for humans. Some studies indicate that safrole may actually stimulate the death of cancer cells, particularly oral cancers though it may also do so in lung and prostrate cancers. One should consult with a doctor, health care practitioner or herbalist before consuming any herb, especially if pregnant, nursing or have some kind of medical condition that requires medication. There is always the possibility of danger when mixing herbs with medications. A variety of other herbs have also been used in traditional root beer recipes (including sarsaparilla, burdock, anise, licorice, astragalus and others). Dave’s simplified version is much more budget friendly as many of these herbs are hard to source and expensive. Before beginning, it is important to have the culture ready to go. Dave uses a homemade ginger bug in this recipe as it gives both the flavor and carbonation, though any type of natural culture could be used. 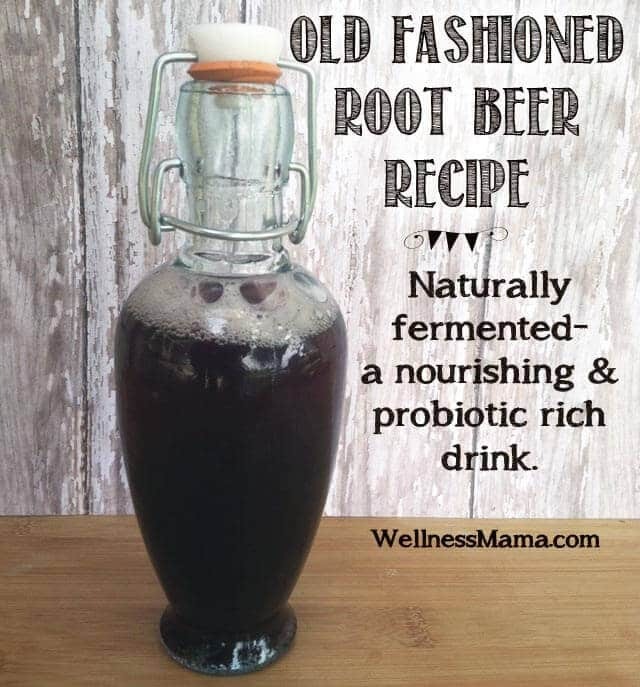 A simple and nourishing fermented homemade root beer (non-alcoholic) with herbs and beneficial cultures.